The Agilent E1326B autoranging 5.5-Digit Multimeter is a B-size, 2-slot, register-based VXI module. It is identical in electrical design to the E1411B, differing only in size. The E1326B can be used in the E1302A or the E1300/01/A/B mainframes. 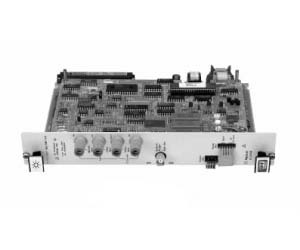 Using the Internal Installation Kit (E1326-80004) or Option 009 when ordering the E1300/01/A/B, the E1326B can be mounted internally in the E1300/01/A/B mainframes (saving two module slots). This instrument is especially well suited for data acquisition and computer-aided test applications. This module can be used as an integrating A/D to make 5.5-digit, low-noise measurements, or switch to the sampling A/D to make 14-bit readings at rates up to 13 kHz. When combined with any Agilent VXI relay or FET multiplexer, you can create a multichannel scanning multimeter. By sending just one SCPI command to the E1300/01/A/B mainframe built-in command module or the E1306A command module, you can program the multimeter and the channels of your multiplexers at one time. The E1326B provides flexible triggering with built-in timer pacer. Product functions for the E1326B include DCV, ACV Offset-compensated Ohm, Thermocouples, Thermistors, and RTDs.